SIETAR Europa Congress in Dublin way a fantastic opportunity to meet interculturalists from al over the world and exchange best practices and the newest research in our field. In my case, it was quite challenging due to multitasking and different roles I had. On one hand side - hosting the congress and paying attention that the participants are constantly well informed and can easily find workshops and presentations they wish to attend. On the other side - being presenter by myself. My TEDstyle talk "Re-narrating European Identity through visual storytelling" focused on the multiple perspectives regarding Europe and its cultural roots based on storytelling and was followed by a lively panel discussion on storytelling approach and characteristics of coaching with Michele Cummings-Koether who presented a talk on "How Psychological Contracts and Cultural Adjustment impact International Assignments" and Diane Elizabeth Mullen who concentrated on "Meeting the Diverse Needs of Corporate International Assignees". Both presenters can be seen in the picture . 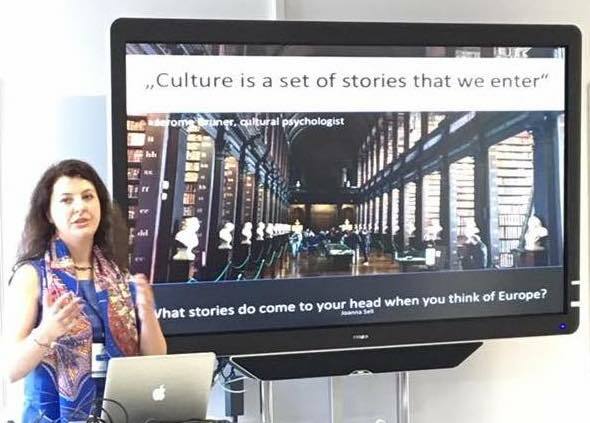 My second TED style talk focused on storytelling and learning from the past, "The impact of migration on Frédéric Chopin's life and oeuvre" gave insights on the human aspects of transition stress for migrants of all centuries. The musical framework was guaranteed by Patrick Schmidt and Elaine Teo Mosimann who played Chopin during the session. I loved this spontaneous micro concert! Even though Frédéric Chopin did not belong to the political wave of migration he definitely identified with the Polish exodus and the so called Great Emigration and experienced the uprooting depression, which can be diagnosed among many refugees nowadays. His music was the best barometer of his emotional struggles firs of all in Vienna, later in Paris and Mallorca. Got curious? Check my text "When tears turn into music" published in the book "Medical and Social Aspects of Trauma"